Andy Peaks is set to meet with the AFC Rushden & Diamonds board next week as the club prepares for life at Step Three next season. Having missed out in the play-offs in the previous two season season, Peaks and his players secured one of the two automatic promotion places available in the Evo-Stik South League East this time around. 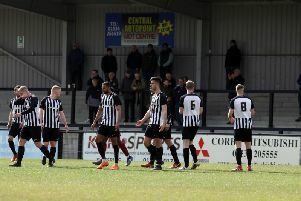 A third promotion in six seasons since the club was formed was confirmed after the 7-1 success over Aylesbury FC lbut Diamonds missed out on the title by a single point as Beaconsfield Town took the crown after both sides won 1-0 on the final day of the season. Top scorer Ben Farrell secured Diamonds’ fifth victory in a row as his first-half penalty proved to be enough to beat Ashford Town (Middx) in front of a bumper crowd of 978 at Hayden Road last Saturday. And, while the celebrations will no doubt continue for a while, thoughts are already turning towards life at a higher level. A restructure of the non-League system is likely to result in Diamonds taking a place in the new ‘Central League’ Premier Division next season. And Peaks is already looking ahead. “It’s going to be an interesting summer,” he said. “We have to wait and see what division we will be in and who our opponents will be in it, so it will be quite exciting for everyone. “From my point of view, I am expecting to meet with the board next week to discuss things going forward. “That’s the first thing we will do and then we look at everything else from there. “I am sure there will be less pressure on us next season as we move up to a higher level but we will want to make sure we are competitive in our new surroundings."